From their offices not far from Berlin’s main railway station, the staff at the Federal Ministry of Education and Research have a spectacular view of the curving banks of the River Spree, the Reichstag, Federal Chancellery and Berlin’s skyline. The new building by Heinle, Wischer und Partner on the riverside catches the eye above all with its soft green natural stone facade. Rectangular, portrait-format windows, supplemented by glass panels dyed green and dark photovoltaic panels create a lively rhythm for the frontage, which is a full 173 meters long and is thus seems pleasantly sub-divided into small sections. 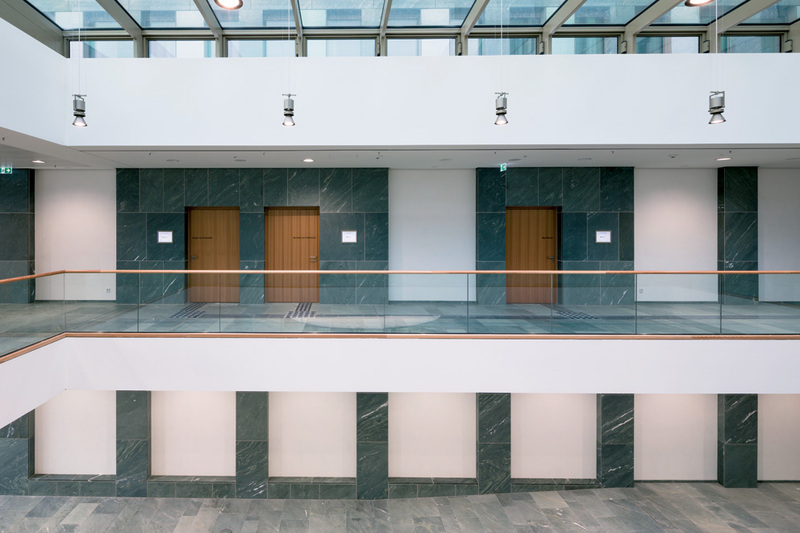 Inside, balanced proportions to the corridors and rooms as well as successful details – extending as far as Simonswerk door hinge systems – ensure that this is a prime government building and not just an off-the-peg office block. The ministry is the first federal building to be realized as a public-private partnership or PPP, which reduced costs – but led many to fear a loss in quality, too. However, the architects are satisfied and Heinle, Wischer und Partner proudly present the result on their Web site as a milestone. The building is, moreover, extremely sustainable. A “smart grid” coordinates the different energy sources, namely a gas-fired fuel cell, a heat/power cogeneration plants, and solar PV panels on the roofs and the façade – the ministry generates 80 percent of its energy requirement itself. Christian Pelzeter, who anchored the project for the architects, speaks of the public spaces becoming ever more private the further inward you move. The lobby zone and the conference level in the spaciously glazed central block still feature the green natural stone used for the façade, but on the office floors there is carpeting and a colored guidance system. The corridors are broad to encourage their use as communication areas and are persuasively suffused by pleasant daylight. 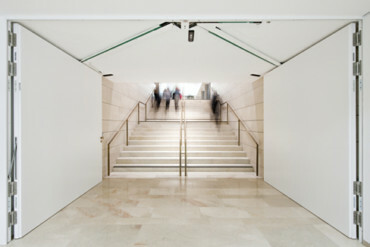 In the entrance area, the ministry’s strongly frequented conference rooms are to be found on a gallery level. 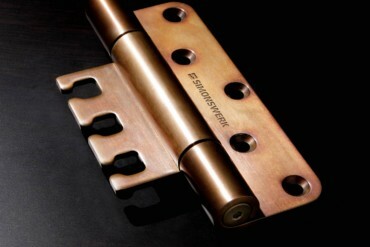 Here, the architects have chosen the durable, maintenance-free door hinges Simonswerk makes. 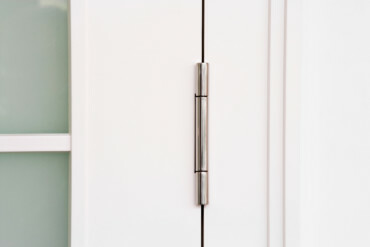 With the Variant VX universal hinges the planners have also made certain that even the noise-protection doors have high-grade fittings. 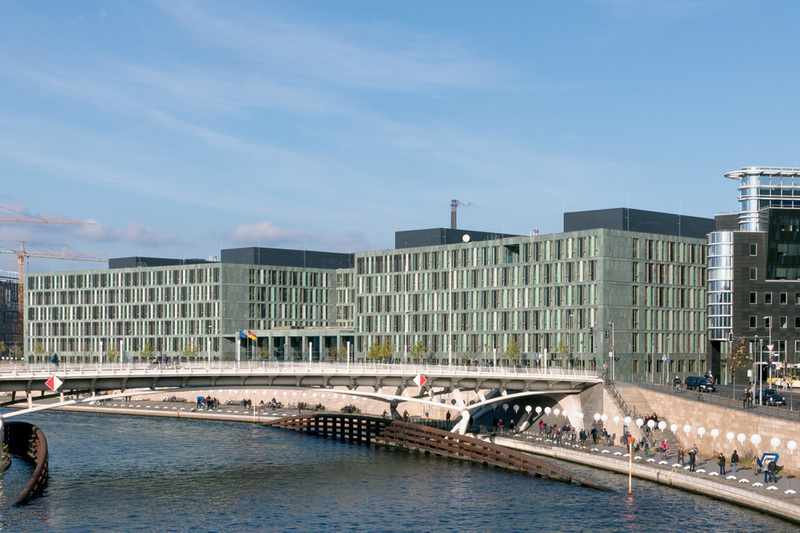 A view of the Spree River: The new Ministry of Education and Research designed by Heinle, Wischer und Partner with its characteristic greenish facade. 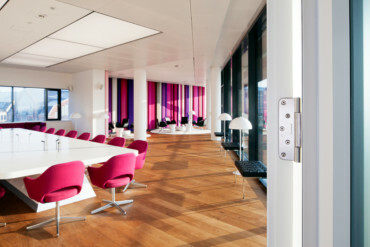 Meeting Point Hannah Arendt 2: The architects chose door hinge systems by Simonswerk for the noise-protection doors to the conference zone. 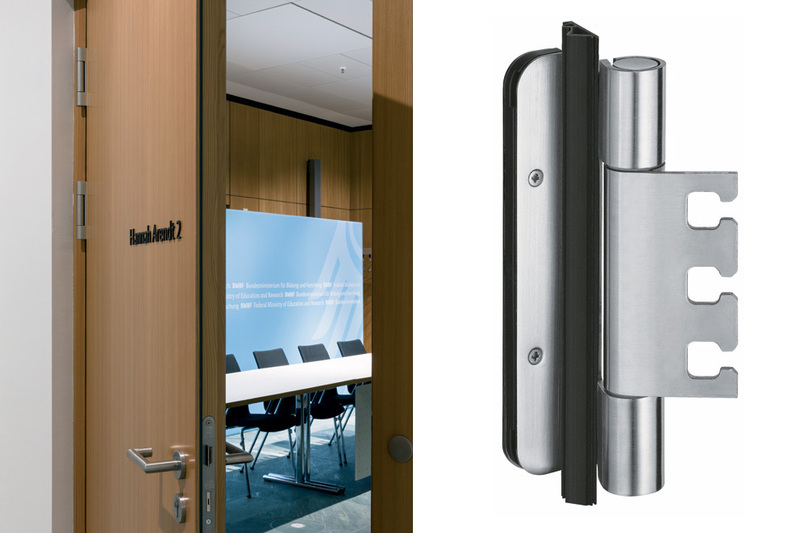 The Variant VX hinge system is especially suitable for doors subject to great wear and tear, and can be adjusted through all three dimensions.